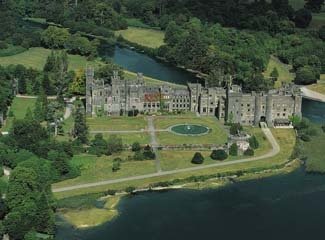 Ireland’s grandest castle hotel, with a history going back to the early 13th century, Ashford Castle is set in 350 acres of parkland, and anyone who loves beautiful surroundings will be thrilled to stay here - or even simply call in for a meal, or visit the extensive gardens and grounds. Grandeur, formality and tranquillity are the essential characteristics, first seen in the approach through well manicured lawns, in the entrance and formal gardens and, once inside, in a succession of impressive public rooms that illustrate a long and proud history – panelled walls, oil paintings, balustrades, suits of armour and magnificent fireplaces. Accommodation varies considerably due to the size and age of the building, and each room in some way reflects the special qualities of the hotel; the most luxurious are at the top of the castle - many with magnificent views of Lough Corrib, the River Cong and wooded parkland. The hotel’s exceptional amenities and sports facilities are detailed in a very handy little pocket book; in it you’ll find everything you need to know about the equestrian centre, falconry, hunting, clay target shooting, archery, cycling, pony & trap tours, golf (resident instructor & equipment hire), tennis, lake & river fishing, lake cruising, jogging, guided walking & cycling tours on the estate - and a guide to scenic routes and attractions in Mayo and Galway; for any visitor to the area, this little book is a gem.